In the mid 1980s the priority rule was changed to be more in accordance with other European countries. From then on traffic on the roundabout had priority over traffic entering it. 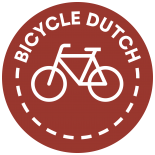 But because of the much higher number of cyclists in the Netherlands the question of how to arrange their priority arose. At first cyclists on the roundabouts and those on cycle lanes on the roundabouts had priority. The ones on cycle paths on the outside of roundabouts had to give priority. Since the speed of motorized traffic on a modern roundabout is so low (around 30kph/18mph), the city of Enschede started an experiment in 1990. They reasoned that with those speeds it would perhaps be no problem at all to give cyclists on a ring shaped cycle path around a roundabout priority over motorized traffic that enters and exits that roundabout. The experiment was successful and soon other municipalities followed. This led to differences in priority between different municipalities and confusion with road users. Confusion leads to unsafe situations so this was unwanted. The government initiated action to remedy this. by having the color of the cycle path continue across the drive way of motorized traffic. By 2010 the recommendations were adopted by most municipalities. Cyclists did no longer have priority on nearly all of the rural roundabouts. But it is different for urban roundabouts: some municipalities refuse to adopt the recommendation even though they were repeatedly asked to change the priority on their roundabouts by even the minister of transport. Assen – hometown of David Hembrow – is one of the dissident municipalities. This could have to do with the fact that one investigation revealed that roundabouts where cyclists have priority were considered “slightly less safe” than those where they do not have right of way. However both situations are considerably safer than traditional cross roads junctions. Apart from SWOV (Institute for Road Safety Research) all the other institutes were therefore in favour of priority for cyclists in built up areas. The findings in said SWOV investigation were disputed and not by the least of people. In 2009 the then minister of Transport (Mr Eurlings) called the raport “outdated”. His first point of criticism was that the figures dated from the time that mopeds (also the faster types) were still using the cycle paths and no distinction was made between crashes with bicycles or mopeds. His second point was that the SWOV investigation made no difference between roundabouts with separate circular cycle paths and those with on street cycle lanes. Under Dutch law, cyclists must have priority on that last type, so it would only make it more confusing if the ones with circular cycle paths around them would not have priority. Also the “extra number of casualties” as calculated by SWOV was deemed as estimated too high. Now that the rule has been in force for over a decade and all traffic users could get used to the priority rules, the Cyclist’s union sees a high and growing appreciation for these roundabouts. Interestingly cyclists also report a decreasing number of “near misses” and they give high marks for comfort. The most important type of roundabout is the single-lane roundabout. It can handle 20,000 – 25,000 vehicles per day. With a steady arrival of vehicles, a roundabout can have a shorter waiting time than a signalized junction. In general, the waiting time for cyclists and pedestrians is shorter on a roundabout, even without priority, than at signalized junctions. When an intersection with traffic lights is replaced by a roundabout, the emission goes down by 29% for CO and 21% for NOx. The noise emission decreases in both cases. Information for this blogpost was gathered from the Factsheet Roundabouts from SWOV and websites from the Cyclists’ Union, VVN, Fietsberaad and other institutions. This post, written by me, was first published on the blog ‘A view from the cycle path’ on Thursday, 12 May 2011. Very informative post, but the conflict diagram for the roundabout only shows the 4 conflicts which occur as motorists enter the roundabout. It doesn’t show the other four where motorists exit, the most hazardous with the old design. Also, the number of conflicts for any given movement is a subset of the total. A cyclist going to the first exit in the roundabout would encounter no conflicts; the second, two; the third, four. Similarly for the other diagrams. How willing would you be to be the parent of a child of 8 who cycles on their own at a roundabout you describe? And other people would be scared, and would be considered unacceptable in the Netherlands unless all the approaches were part of a very low volume 30 km/h zone and even then, most roundabouts aren’t built in that area. The volumes in a 30 km/h zone should not be high enough to even need a roundabout. 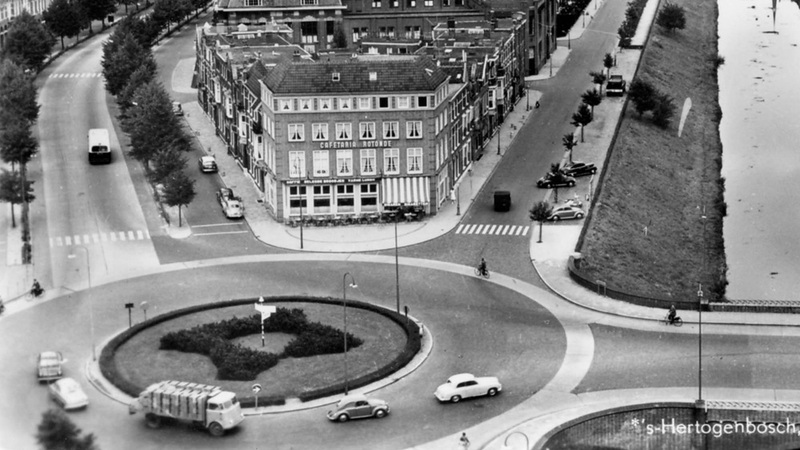 Ironically the roundabout from the 60’s in the picture in Den Bosch doesn’t exist anymore. It’s been replaced by a very weird and unclear junction. Yes but that picture was an example of how NOT to build roundabouts anyway. That ‘unclear’ junction is from 1965 and will be gone by the end of 2012. An upcoming blog post will tell you all about it. Roundabouts shouldn’t have cycle lanes on them. They are even more dangerous than a roundabout where bicycles and cars do mix. I wonder why the Dutch ministry of transport or of the interior doesn’t require municipalities like Tilburg and Assen to build roundabouts of the priority type. Netherlands is a unitary state after all, there is danger in not having uniformity. Also note that turbo roundabouts should be grade separated from cycle paths if present, they don’t work quite so well with at grade crossings. There are a few with at grade crossings but these are often disliked by the locals. Just last week I was yelled at at a roundabout in Ottawa (not common though) by a driver who screamed (!) that I had to “F@ck off the road and get to a YMCA if I want to cycle”. Cyclists don’t have their own lanes here outside the circle. Roundabouts are fairly new and 99% of the drivers has no clue how to deal with them it was one thing to implement them but another to educate drivers how to use them. Cycle lanes are actually more dangerous than if bikes and cars were mixed, but a cycle track is much safer than both. This entry was posted on 12 May 2011 by Bicycle Dutch in Original posts and tagged infrastructure, junction design, roundabout.